Apologies for the lack of posts recently, how can retirement make you busier?! Anyway, I was up in County Donegal a few weeks back with family checking out the scenery and I managed to make time to call in with John Dickie. This was a first time visiting John and I’m sure it’s not the last. 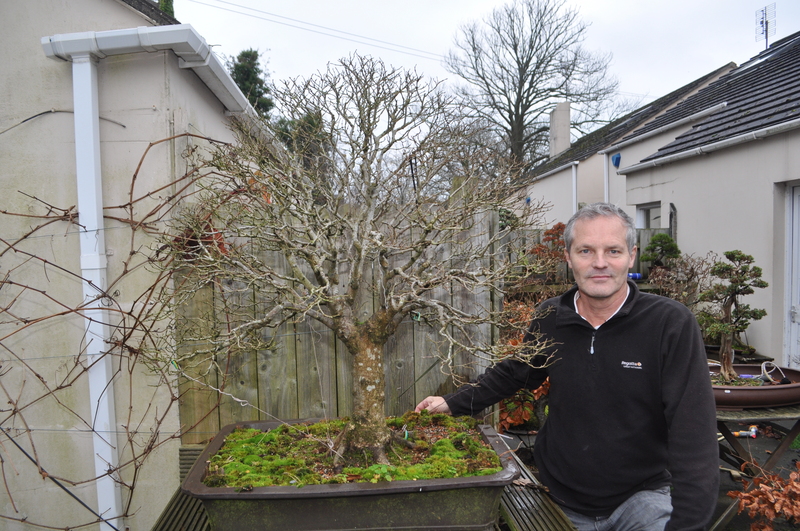 John was previously a chairman of the North East Lincolnshire Bonsai Society, and now is enjoying his retirement in the stunning countryside of Donegal. The main reason for my visit was to sound him out in supporting the creation of a club in the Northwest based in Omagh to begin with. John was quick to offer his help. We are still doing a round up of anyone interested in Donegal, Tyrone and Fermanagh. Please get in touch. 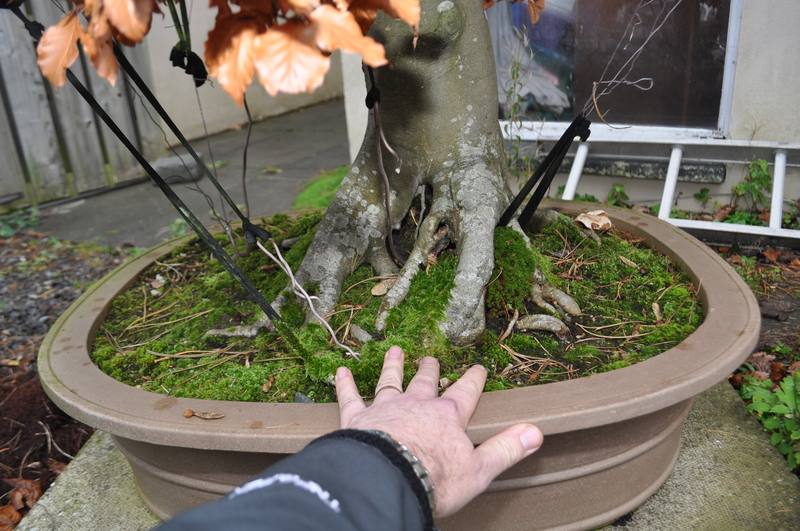 It was a flying visit with both of us trying to get to know where we stood in our approach to bonsai. 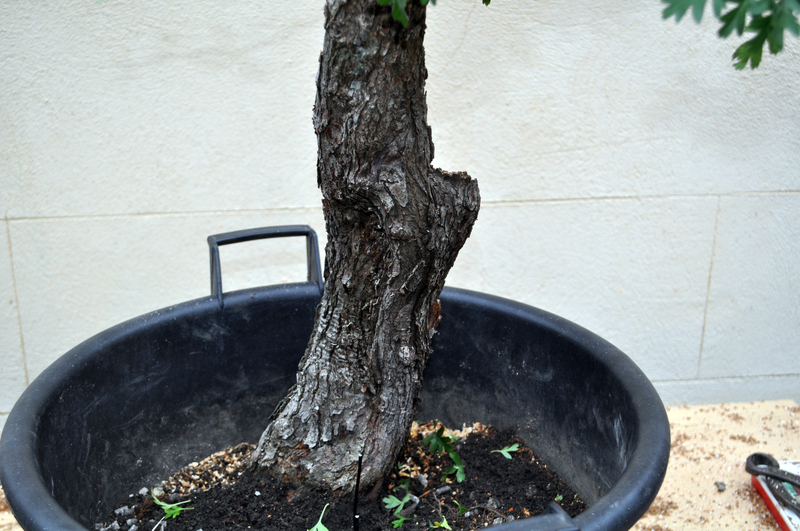 I was able to grab a quick walk around his garden and see some of the trees he’s brought over with him from the UK. Hope to see you again soon John. Nice to find a fellow mini hosta lover. On Thursday the morning, after an amazing night with Coldplay, we drove over the Mark and Ritta’s garden.We got a warm welcome and I was warned that the garden wasn’t quite finished. I can only wish that one day my garden isn’t quite finished like this one. It was clear to see the quality of material used and the knowledge that was required to get it so perfect. Mark and Ritta of course pointed out what wasn’t finished or what they weren’t quite happy with, but that’s the way with gardens, are they ever finished? 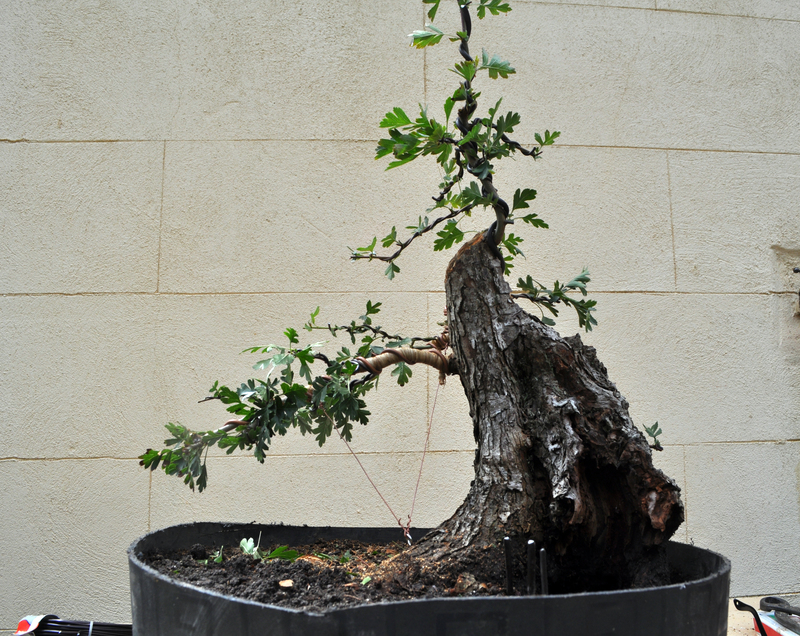 The bonsai were just superb and Mark very kindly gave me a guided tour of each tree and it’s history. 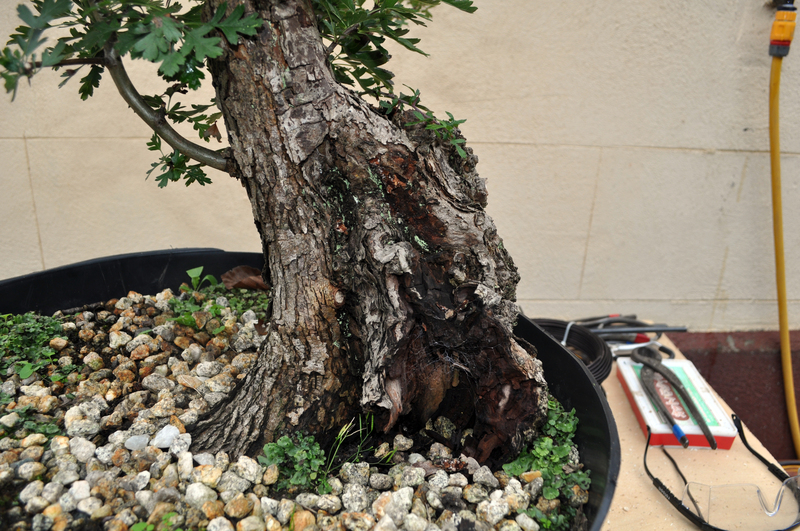 A nice mix of Japanese origin trees and some of more humble origins that have been worked to a high level over the years. Known for shohin, the Coopers certainly had a great collection of small trees, but the larger trees were to a high quality level as well. 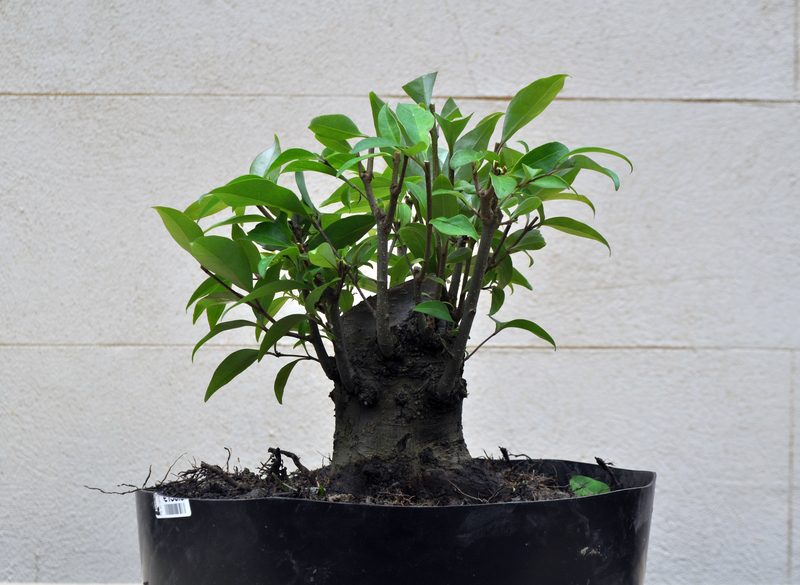 As a kusamono lover it was great to chat with Ritta about varieties etc and I’m really looking forward to hearing their talk at Bonsai Europa in October. I’m not even going to dwell on the koi! See for yourselves in the gallery below. Thank you both for making Allison and I so welcome and for the hospitality you showed us. A highlight for me was Ritta’s cake 🙂 The four hours flew in and in the end we just about made it to our ferry back home on time. 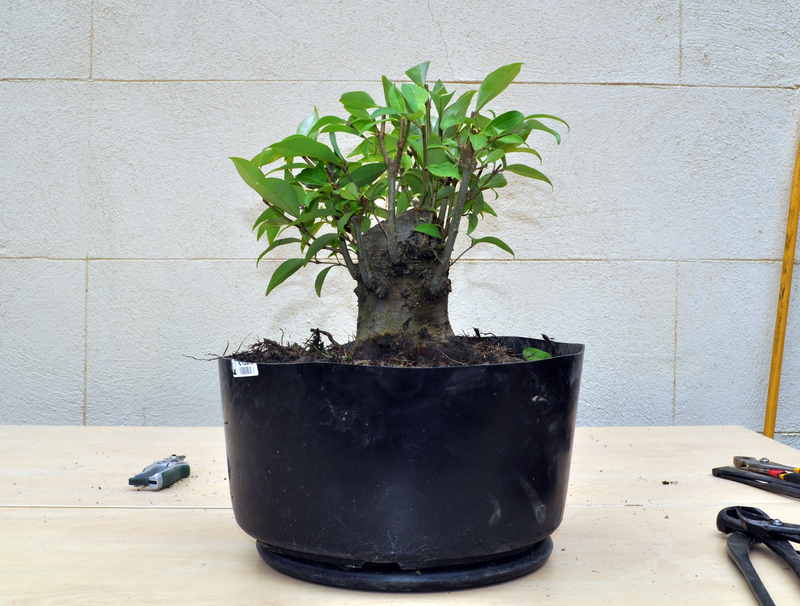 Bonsai as a hobby is full of wonderful people and these two are certainly on that list. See you both soon. When I was over at Suruyama Towers the other week I had the pleasure of spending a few hours with Steve McKee who was visiting. Steve and I have a fair bit in common and it was good to get a walk around the trees and chat bonsai. 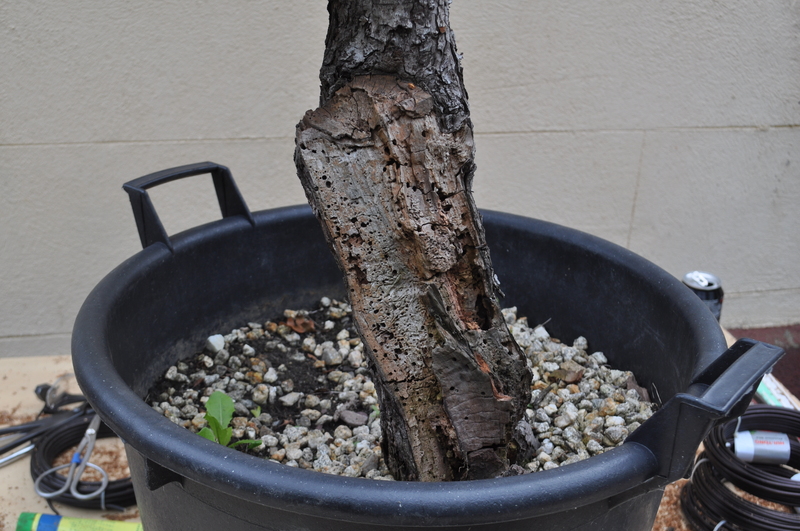 Steve picked up a nice Literati Scots Pine from Peter when he was there and I have been following what’s happened since on Steve’s Facebook page ” Steve’s Bonsai Garden”. This is the Pine as bought. 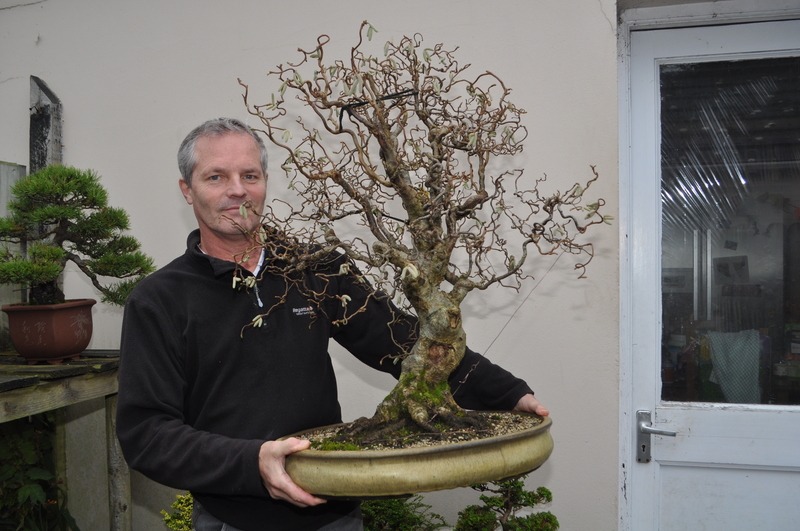 Steve has since worked on the tree with Paul Finch and this is the result. More photos over on his FB page. 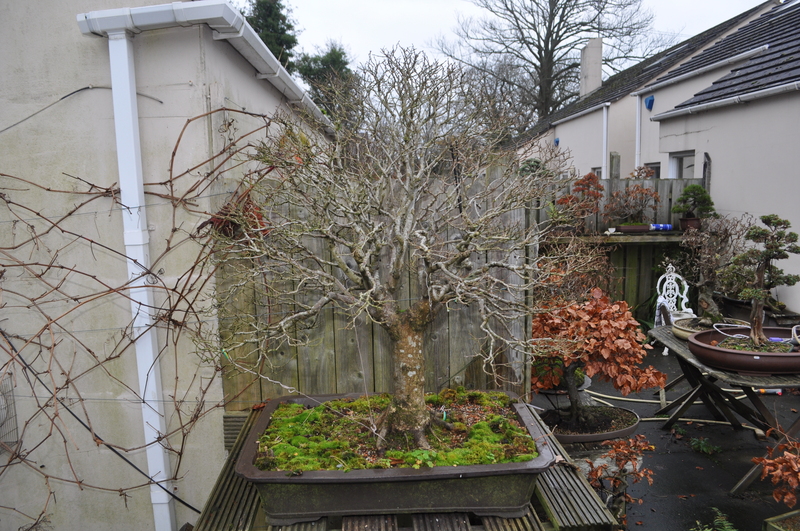 Steve has a fantastic collect of trees and and great garden layout. Well worth a follow over on Facebook to see more of his trees and follow his exploits around some of the exhibition in the UK. Whilst in Tenerife I had the pleasure of finally meeting up with Jose Acuna. Jose and I have swapped a few plants over the years and chatted on Facebook but I never crossed paths with him until now. Jose kindly picked me up from my hotel and showed me around his collection. 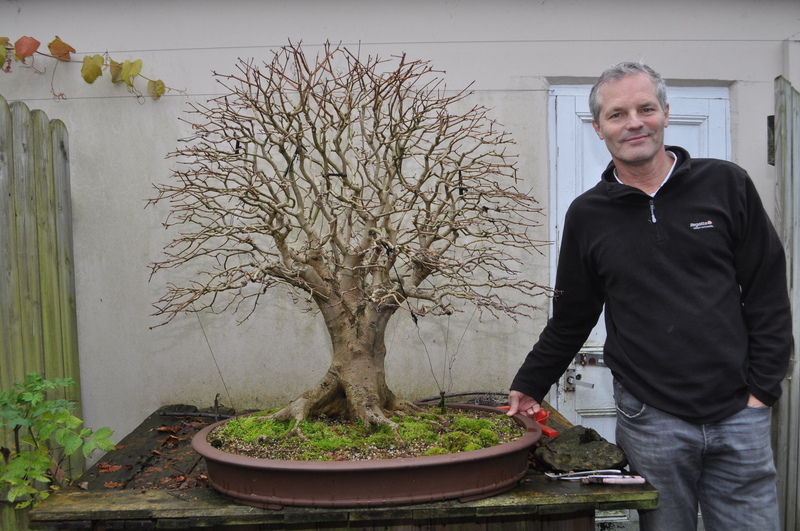 I had a great few hours with him chatting all things bonsai. 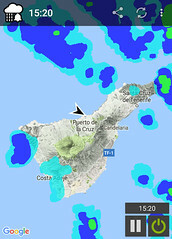 Interesting to chat about the major differences in climate, watering, species etc, between Ireland and the Canary Islands. They have heat and light but crap water. We have no heat and poor light but loads of great water lol. Here are some of Jose’s trees, some fantastic shohin among them. This great little juniper won the 2nd World Shohin Photo Award The submitted image can be seen below the one I took on my visit. Some of Jose’s awards displayed on his workshop wall. I also fell in love with this pot. Truly beautiful carving. I’m kicking myself for not taking a few photos of the pots that Jose made himself recently. Some very nice work. Just a shameless plug for my friends Facebook Page. Please pop over and give his page a wee like. 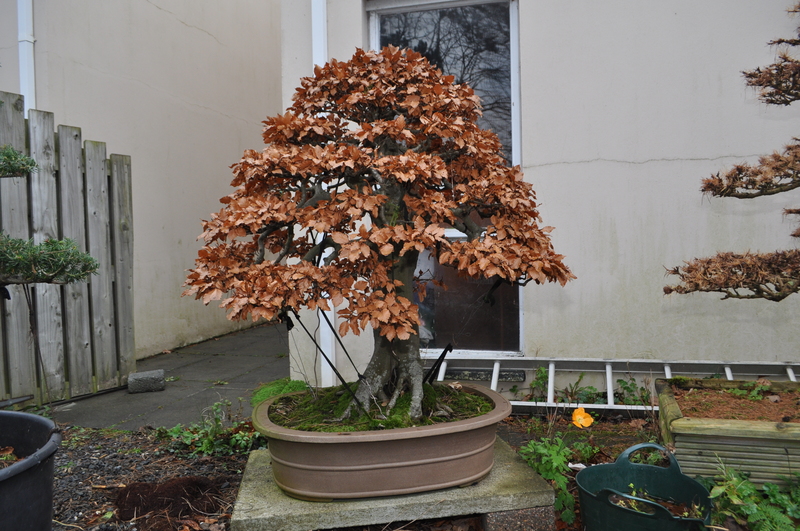 I popped over to a friends house on Saturday with a view to helping him select a tree for entering in Bonsai Europa next Autumn. It was nice to see some of these trees for the first time in Winter image. 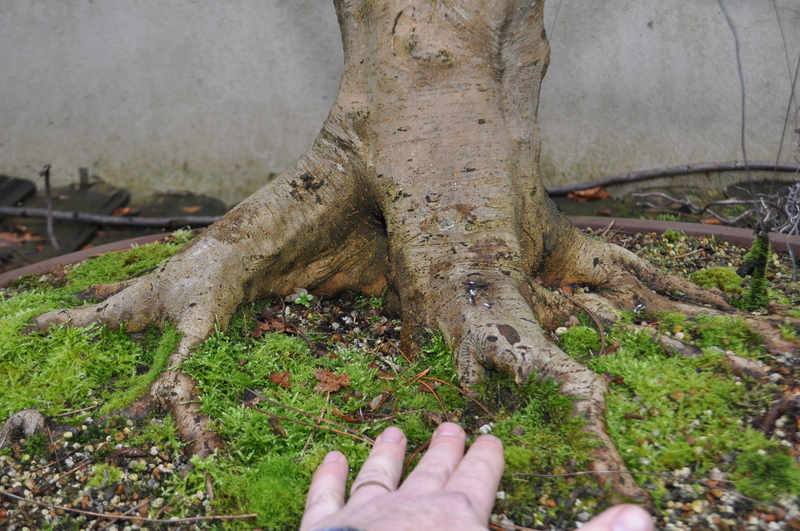 This Beech is a monster. 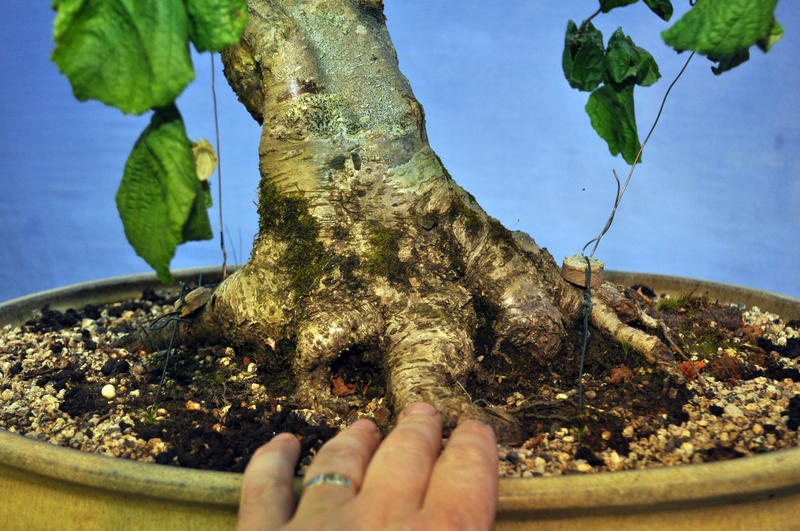 This Acer Campestre or Field Maple isn’t much smaller. 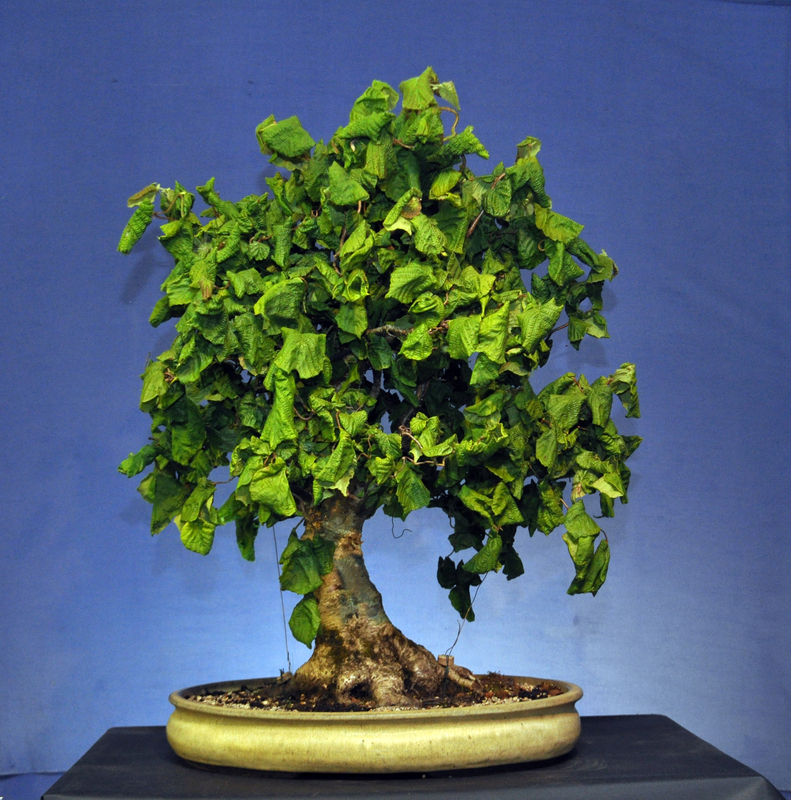 And a little smaller again, this Ulmus Glabra or Wych Elm. Hard to see with the poor backdrop but again, you get the idea. 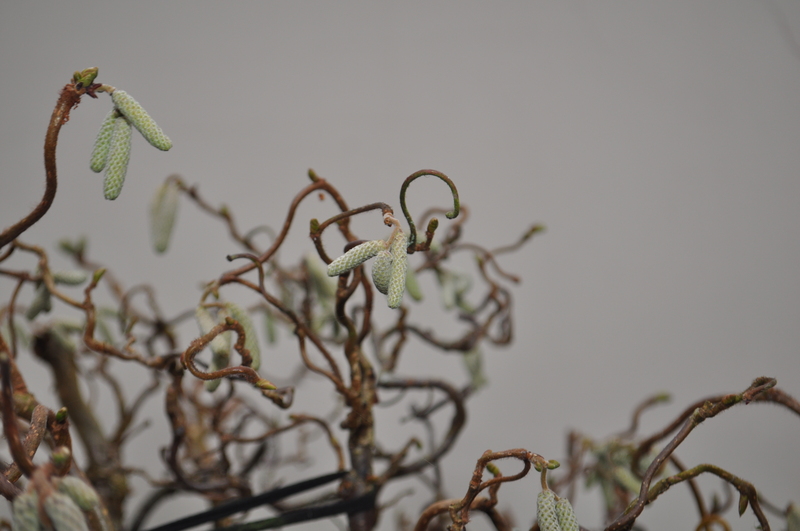 And last but not least is a Hazel, it’s covered in Catkins for next Spring and even produced 6 Hazelnuts this year past. 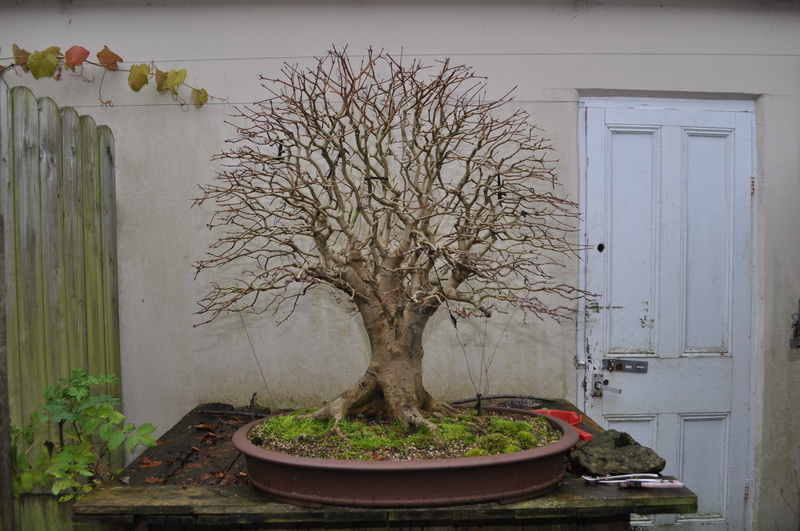 This is a Contorted Hazel in my care at the moment for a friend who’s on Holiday. This is it’s first year in a pot having been field grown up until this point. 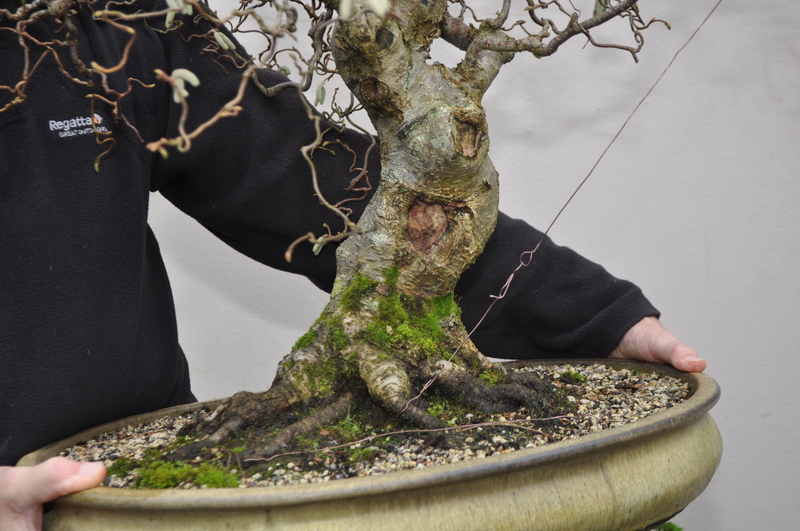 Better in Winter or Spring with catkins, but an impressive bonsai of this variety.Best I’ve seen anyway. Two more getting their first direction. 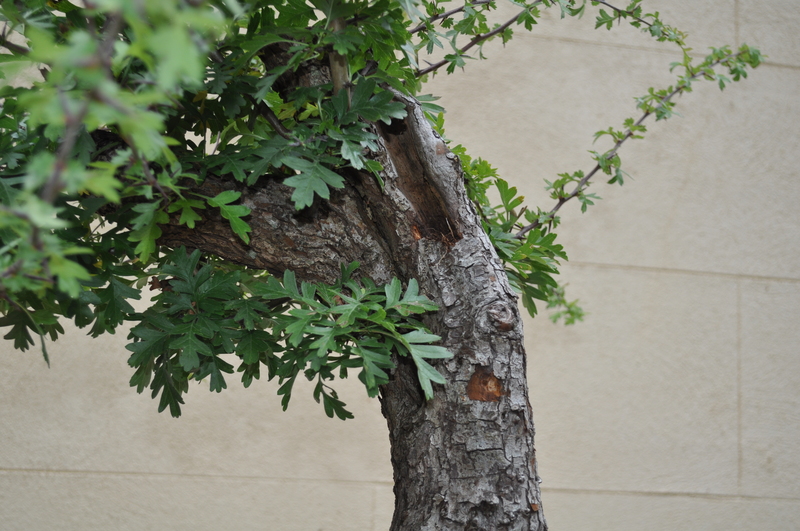 First is a hawthorn with great bark and second is an unusual variety of privet. 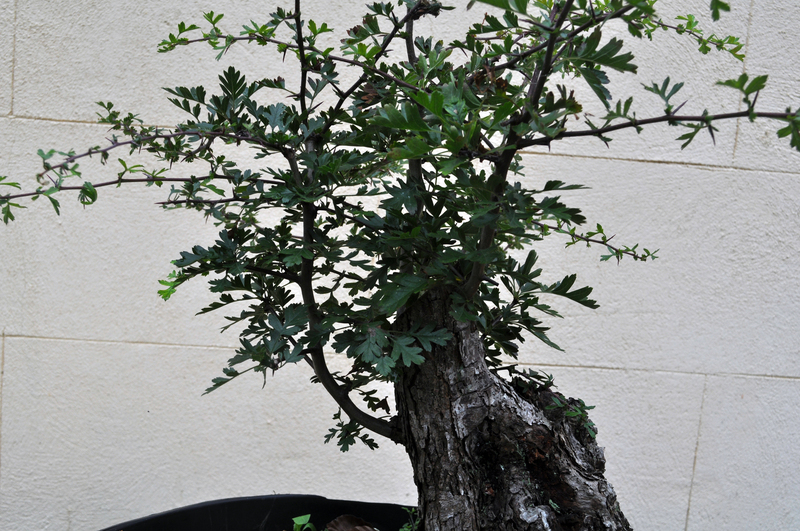 This is another Hawthorn I worded on on Saturday, collected from a hedge a few years ago using a digger and now well established in a pot. Some amazing deadwood that will now be protected. 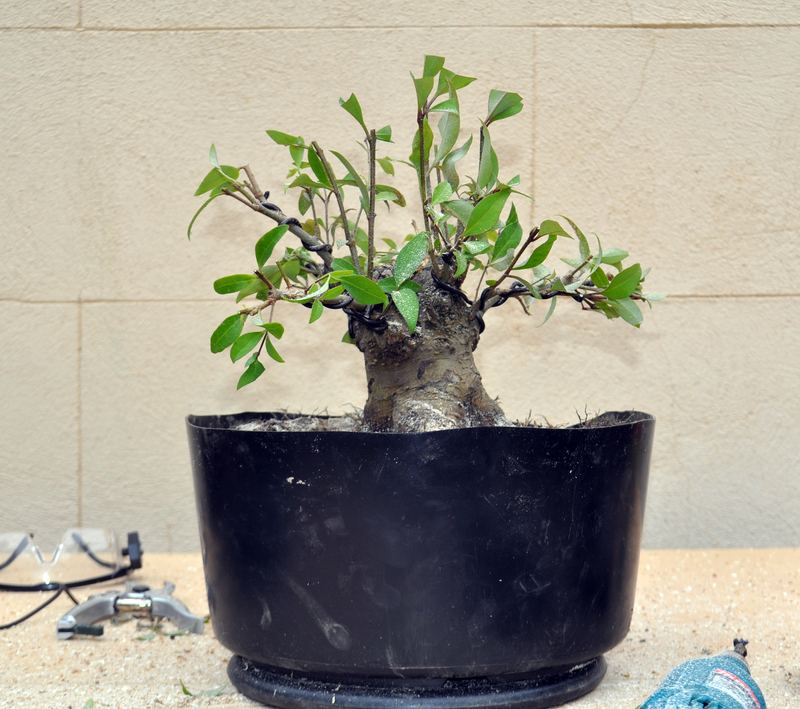 Branch selection and some basic placing done. Raffia on a few of the heavy branches to get the right placement. Leader left to grow free to help with taper. 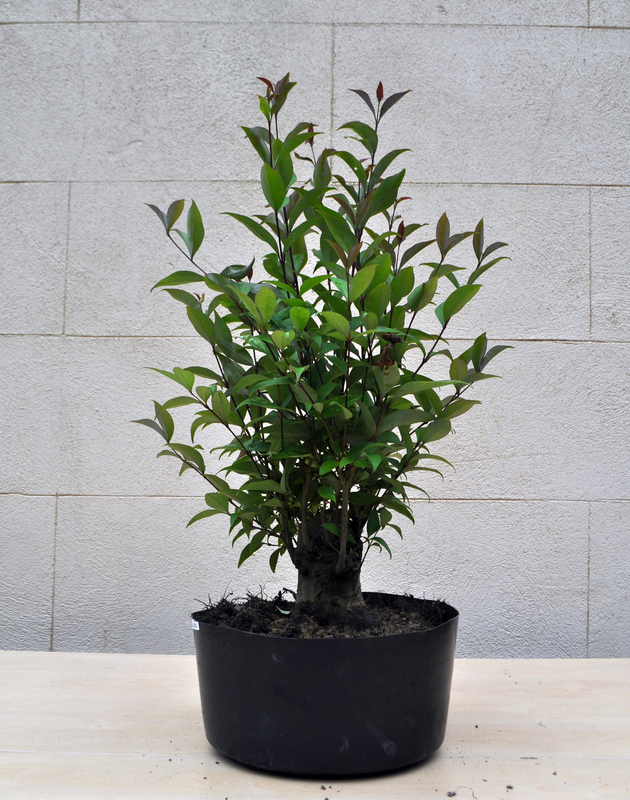 This will be another great tree in a few years time. 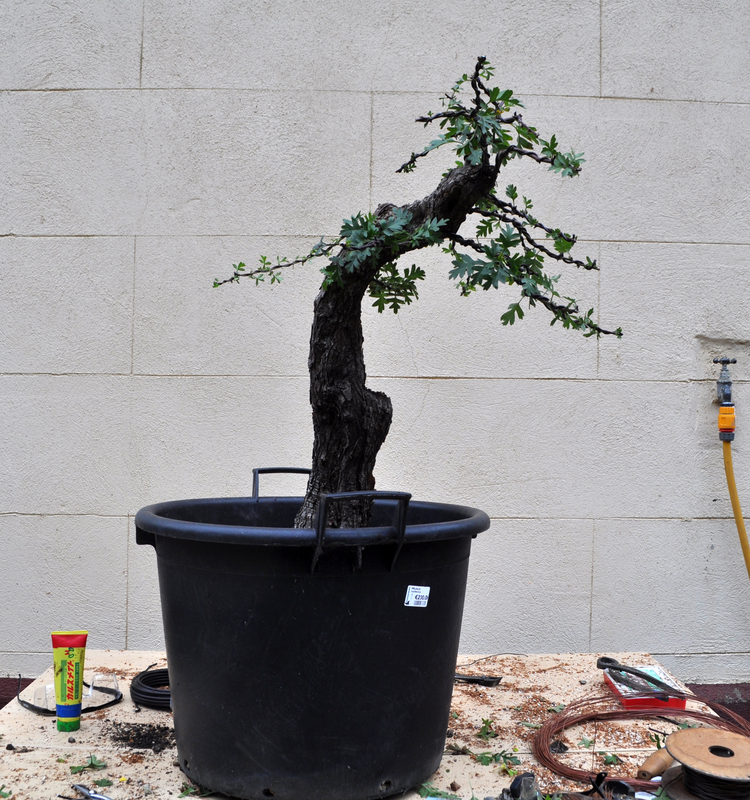 I had the pleasure of working on this tree yesterday. 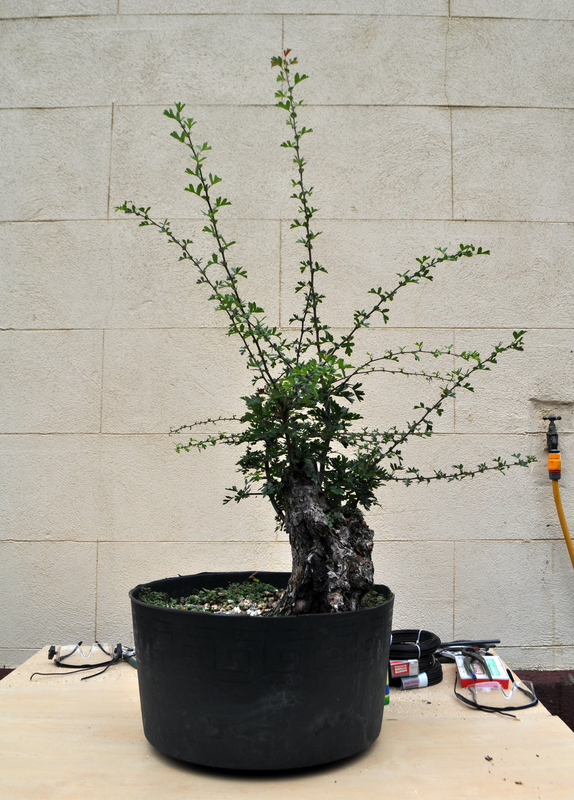 This Pyracantha was a beast collected from a garden a few years ago. 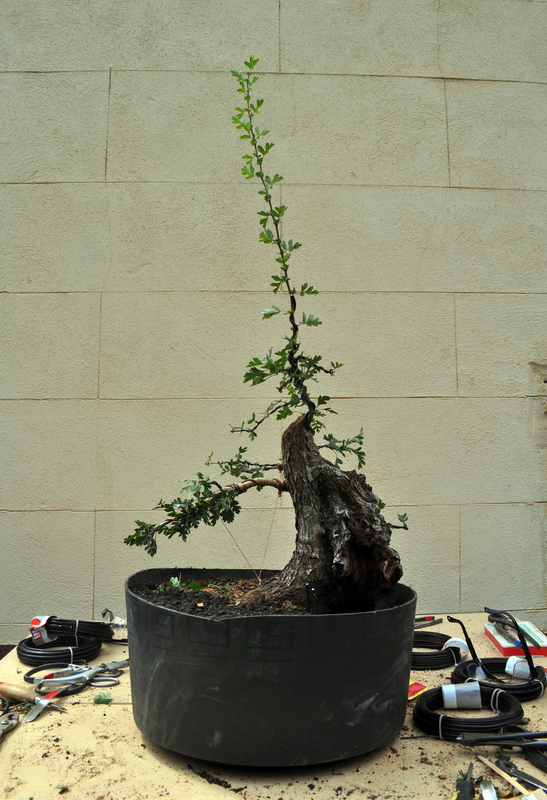 It was time to do some branch selection and a little placement with wire where it was required. 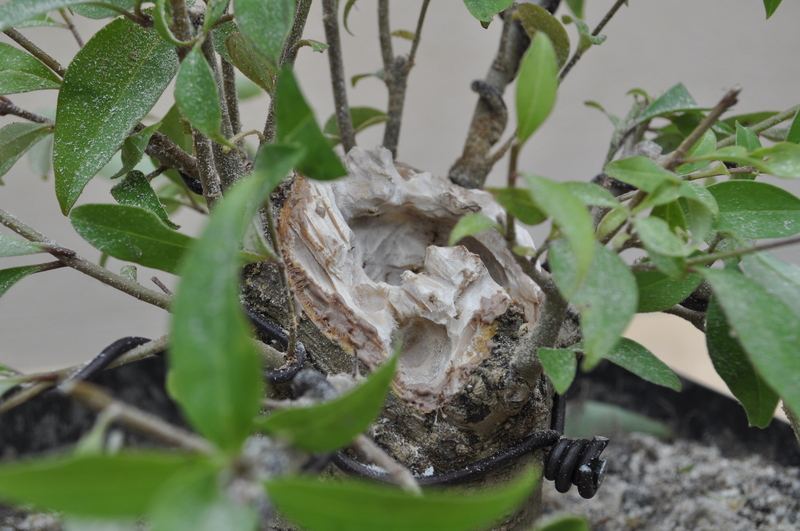 First though we had to define what was alive on the trunk and define the veins. 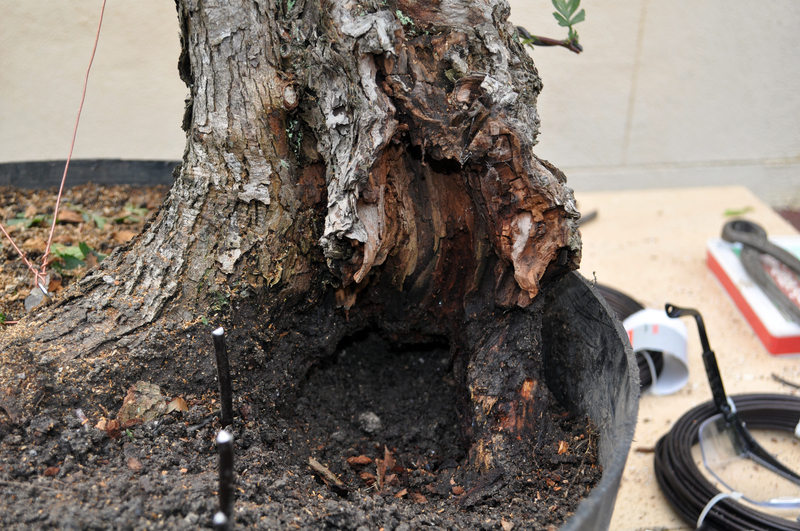 Most of the trunk was dead but it had two live veins and an impressive base once we uncovered it. 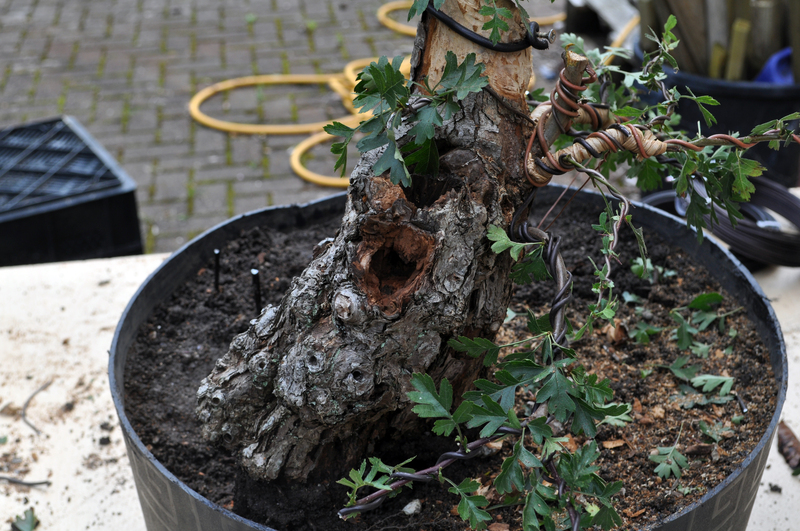 Bark was removed from the dead areas but no detailed carving was done for now. The top of the chop would was removed as this wont be needed in any final design. 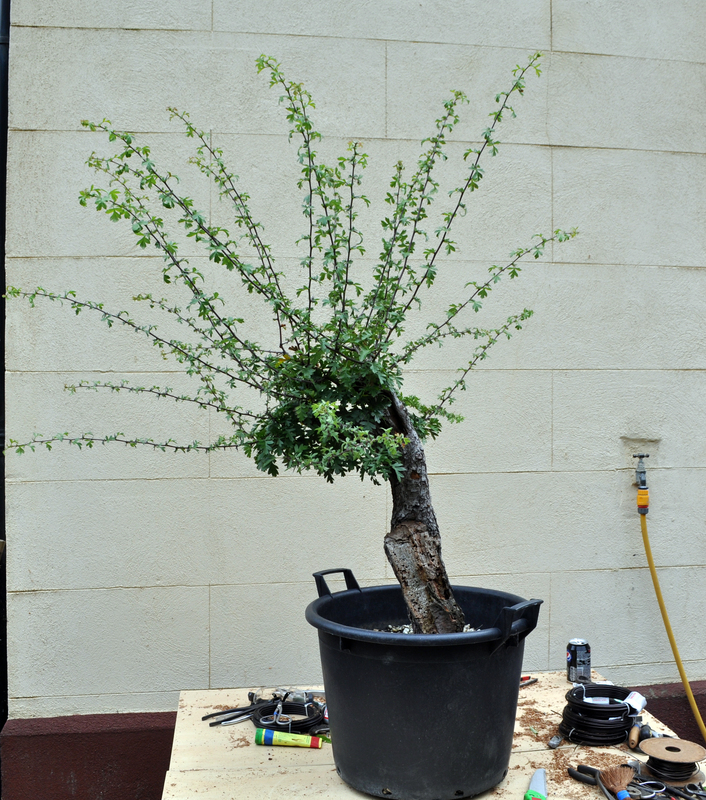 A repot in the Spring and this tree is well on the way to being one of the most impressive Pyracantha I have seen.